It’s been crazy busy here with the little grands but I am finally putting the finishing touches on my fall décor! This year it needs to be 4 and 5 year-old proof with durable and touchable decorations that can really be enjoyed. Sooo…I have collected all of my fabric pumpkins and corralled them in one basket. Not only are they great for little hands, they were all easy and inexpensive to make! Miss Kitty helped to supervise the arrangement so you know it will be perfect…for now! ;-) And the best part is that they can stay out until Thanksgiving! Perhaps my favorite are the super-easy NO-SEW SHIRT PUMPKINS! A trip to the thrift store netted me all that I needed to create them! New this year…my easy-to-make BURLAP PUMPKINS! They also have a no-sew version and cost almost nothing to make! And a durable favorite of mine…my EASY SWEATER PUMPKINS…which require only minimal sewing and use a Dollar Tree pumpkin as the base! Now just pull them all together with a little faux ivy, add a little chalkboard sign and …taaa daaa!…you have your very own pumpkin patch that will last from year to year! And if you need a few more ideas for creating pumpkins, check out my 12 EASY IDEAS FOR PUMPKINS…with wreaths, pillows and lots more! And stay tuned…there’s more fall décor to come! These are so cute and look warm and cozy for the coming cooler weather. I am sure the grandchildren are having a fun time cuddling these little guys! I love all these pumpkins and your very wonderful helper.Miss Kitty does a great job and so pretty. 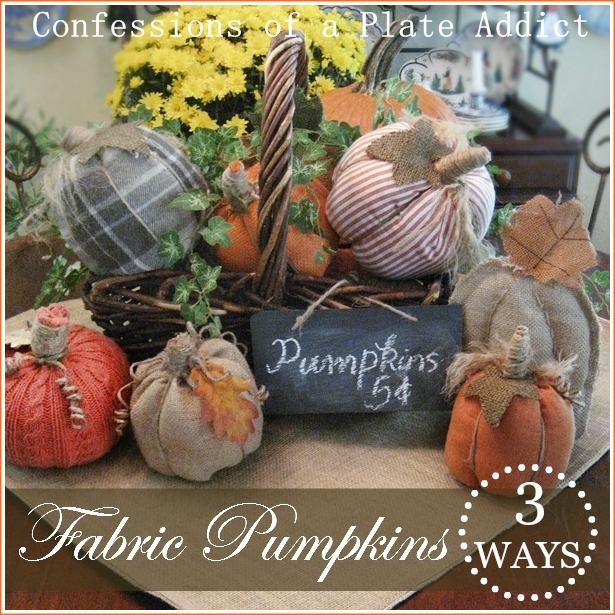 Hi there, I love, really love your fabric pumpkins-they are so perfect for this time of year. If I didn't have a full plate already, I'd be making some too. Thanks for sharing! Your pumpkins and your kitty look so comfortable together! LOVE your ideas, Deb! You are one creative girl!